When it comes to spices & also herbs, potency is everything! As a rule, the higher the potency of the spice, the higher the price it can command in the marketplace among knowledgeable commodity buyers. Think of aromatherapy and how you can have an immediate change of mood when affected positively by soothing aromatherapy. Well, potency of spices can also provide an element of satisfaction with a much smaller ingestion of an actual food item–thus you get more bang for your calorie buck. Another way in which good-for-you qualities of spices & herbs can be measured might actually be something you are not yet familiar with. In terms of one potential good-for-you quality of spices and herbs and some food ingredients in general, the public used to consider the item’s potential antioxidant capacity determined using one of several measures, specifically what is called an ORAC values scale of comparison (Oxygen Radical Absorbance Capacity). Suffice it to say that for example, many India origin spices have a very high ORAC value which would make sense since only a very, very small amount of any of them would actually wind up in a given portion of food. Cloves, oregano (not marjoram), rosemary, thyme, cinnamon, turmeric, and sage, for example, score very high in terms of ORAC values. You’ll also find that other food items besides herbs and spices, such as pomegranate juice, blueberries, cranberries, and even chocolate will show up higher on a list of food items based on ORAC values for reasonable quantities to consume. In Europe, back in 2010, a decision had previously been made by the European Food Safety Authority (EFSA) to disallow food and health claims that focused on ORAC values. Next, in the year 2012, USDA made a decision to remove it’s ORAC compilation from the world wide web. After that, the McCormick Company removed their color chart .pdf that was called “Spices and Herbs, A Surprising Source of Antioxidants, Antioxidant Comparisons of Spices and Other Foods.” That abbreviated compilation of ORAC data had come from the Oxygen Radical Absorbance Capacity (ORAC) of Selected Foods – 2007, Nutrient Data Laboratory USDA, November 2007. The McCormick Company had offered an ORAC Chart which used to be found on the McCormick Company’s site “Spices for Health” program informational offerings, but was taken down respecting USDA advisement. You’ll find that McCormick still offers a wide range of spices, however, they now promote them in light of their ability to contribute to food FLAVOR. They no longer call any of the spices “super spices” per se since that type of terminology could mislead consumers when making choices. The bottom line here is that you can enjoy spices for many reasons, but don’t overly obsess about their ORAC content. 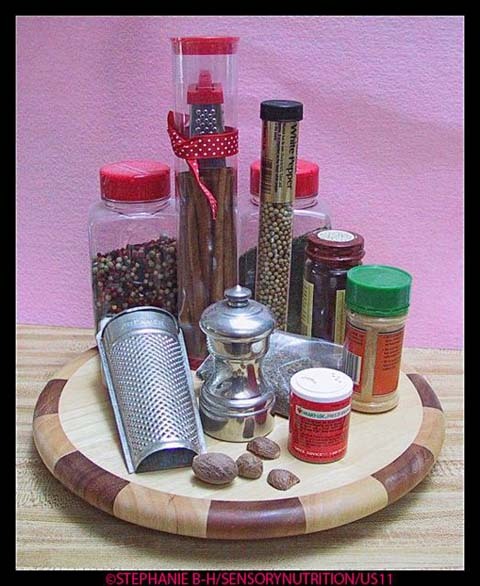 Optimally, spices should not be ground until they are going to be used, so there are cinnamon graters, nutmeg graters, etc. and our ancestors used to only grate what they needed when they needed it. Smart approach! In terms of spices, whenever possible, purchase them whole, unless you require finely ground ones such as for cookie recipes, etc. When you “pre-grate” or “pre-grind” anything, you create an enormous amount of surface area and then expose the tiny grated pieces to potential damage by further contact with air and sunlight. Precious aromatic oils can be easily lost to the air, which is not what anyone wants. Of course, pre-ground herbs and spices are very convenient and we bow to convenience in a time conscious society. Once you understand why pre-ground spices and herbs have such a short shelf life, remember to help protect that shelf life by storing them in cooler, darker places away from any sunlight as well as away from any heat and moisture exposure from close proximity to your cooktop, stove or oven, etc. Spices and herbs can truly enhance flavor perception in so many ways when used alone, but especially when used in pleasing combinations. Avail yourself of opportunities to enjoy them any chance you get!